No extra curricular to boast upon, no social work, no extra talent. 1. Either don’t even try and then think about it my whole life that I gave up on a bright future because of my past. 2. Ignore what my past scores were and try to score as much as possible so as to get a top10. And like all of the serious aspirants who literally have a motive behind doing an MBA other than a fat pay cheque, I opted for the 2nd one. This is the first lesson for all of us, instead of crying about our past let us give CAT our best shot. Second lesson is to know your arsenal. For me I had a 10 hour job, 5 days a week. I was relatively good at DI and QA. So to make full use of available resources I tried to read 2 articles daily while at work, 2 hours of online class with iQuanta and atleast 3 hours of self-study. I am not an avid reader, so to me reading itself was a part of preparation. I relied on sources like aeon, aldaily, epw etc because most of the RCs have a language similar to these. Try to make best use of the resources available like time, study material, efforts of your mentors etc. Since we are living in a digital world where we have information flowing towards us from all directions and hence we are bound to get confused, so this is where we all get confused regarding the study material to be followed. Let us have a 2 phases here. 1. Clearing the basics- for this you can refer any standard book like Arun Sharma, Sarvesh kumar etc. For VARC and LRDI refer study material of any standard coaching institute. 2. Going to the next level- best source for this purpose are past year mock papers and to be more specific- AIMCATs 2017, 2018 were not that good considering difficulty level of all 3 sections put together. For solving good quality LRDI questions one can refer 2018 CL and iQuanta mocks since they were mostly CAT level. And for some high level QA question you can refer 2018 iQuanta mocks or SIMCATs. And to make it more clear try to complete these 2 by July end. In the end comes the strategy on how to utilise every minute of 3 hours that CAT gives us, and for this purpose we have our mocks. I repeat, mocks are to help us build a firm strategy on how to attempt the real exam and not to judge ourselves. Some days you’ll end up scoring 80 percentile while you can even score 99 on the other. But do not get demotivated or carried away by your performance in mock tests. Try to strategise on how to go about a particular section, how much time you need for VA and RC separately, how you judge which all sets you are going to attempt in LRDI and how to attempt QA in 3 rounds as per your comfort level with different topics. If you have this strategy in place, you will see that your consistency improves and you are more focused to improve upon your weaknesses. In the entire mock season, you will see difficulty levels of different topics going up and down since they are strategically designed. You might have a test where topics you like are on a higher level so you’ll end up screwing that test, but if you have your strategy right you will spend more time on solving the easier ones even if they are not your favourite topics. Remember, goal is not to solve questions from a particular topic but the goal is to score maximum marks. This is where most of the students failed in CAT-18, when QA was tough and it was unpredictable. 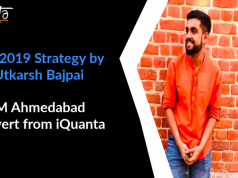 To build a strategy you need to analyse your mocks with full commitment because most of us find it boring thinking that I am not going to make these mistakes again but end up repeating them every single time. Mock analysis has 2 benefits. 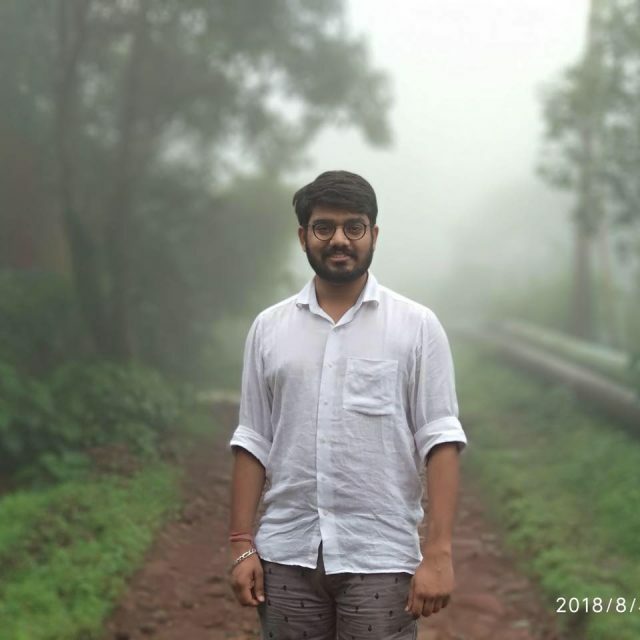 It gives us overview to understand how you perform during those 3 hours- whether you were nervous and made silly mistakes or you could not judge a question and missed on easy questions and secondly it gives you an opportunity to realise the pattern of your mistakes, because when you analyse 10-12 mocks you will realise that you are making same types of mistakes over and over again be it VARC, LRDI or QA, pattern remains same for most of us. So to correct this try to maintain an error log. Note down the mistakes you make in every test and try to categorise them as per your understanding. While you are moving through this season of mocks which generally starts in July but serious one in august, remember to work on the strategy to attempt every section. It took me 30 mocks to build it but it really helped when it mattered the most. I tried to give 45 minutes to RCs and 15 minutes to VA part. This may vary as per difficulty level of respective part but more or less it remains the same. Try not to attempt all RCs in one go. Take up 2-3 VA questions after every couple of RCs, as it helps you against saturation. In LRDI, I tried to spot 2 sets which I am not going to even touch. It worked well for me however you can work out your own plan. For QA I followed 3 round approach. Round 1- Solve all the questions that you definitely know and are within your comfort zone. Round 2- solve the questions that you feel you can solve but will take 1.5-2 minutes. Round 3- Try to solve questions that are not from your favourite area and will take more than 2 minutes. This approach helped me to take a look at all the questions and I ensured that I am not missing out on easy marks. 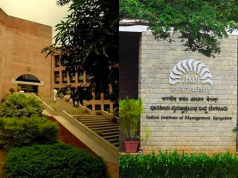 Now coming to which institute mocks to take. Try to take 2 standard mock series. 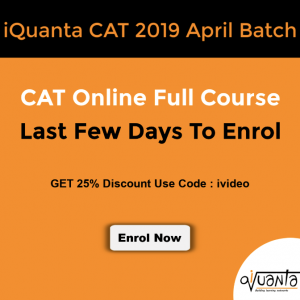 For some unpredictable CAT type tests one can follow iQuanta test series ie iCAT and other option can be 1 out of AIMCAT or SIMCAT as these provide you with proctored tests that help in getting an essence of the real exam. 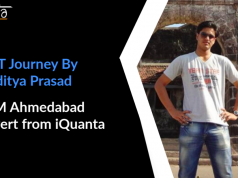 I started my preparation in July and ended up scoring 99.30. iQuanta follows an approach that makes most of the top B-schools successful ie peer to peer learning and this is what makes it the best in the field.